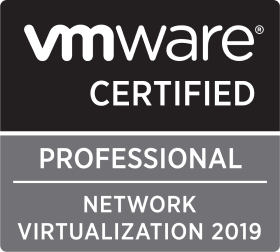 With the release of VMware NSX for vSphere 6.4.1 on May 24th 2018, interoperability/compatibility between VMware vSphere 6.7 and NSX was achieved. In addition to this, a number of nice new features were also included in the update. In this article we will upgrade a 6.4.0 (build 7564187) lab environment to 6.4.1 (build 8599035) utilising the One Click upgrade process. Load Balancer Scale, specifically, an increase from 32 to 256 pool members. Ensure your upgrade path is supported. 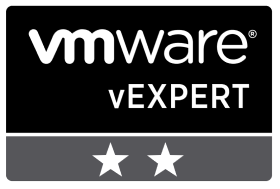 Ensure compatibility with your vCenter Server and ESXi hosts. At time of writing, you must be running a minimum of vCenter Server 6.0.0 U2. Ensure you have a backup of your vCenter Server, NSX Manager, and vSphere Distributed Switches. 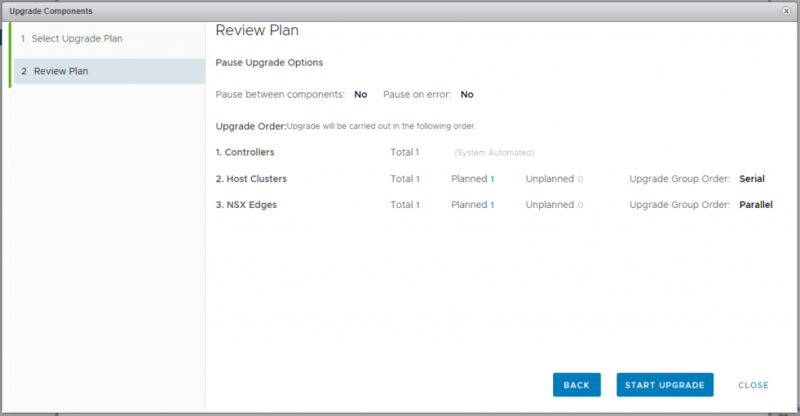 The One Click upgrade will take care of the entire process, however, for reference, your NSX components will be upgraded in the below order. In my lab environment I only have one NSX Controller, and my Edges are not configured with High Availability. VMware obviously recommend that you are running a minimum of three NSX Controllers, however, for a lab environment, I can handle the outage. Likewise, I’m fine with losing North-South traversal when my single-instance Edges are upgraded. 1. Ensure you have taken backups of your vCenter Server, NSX Manager, and vSphere Distributed Switches. 2. Download the VMware NSX for vSphere 6.4.1 Upgrade Bundle. 3. 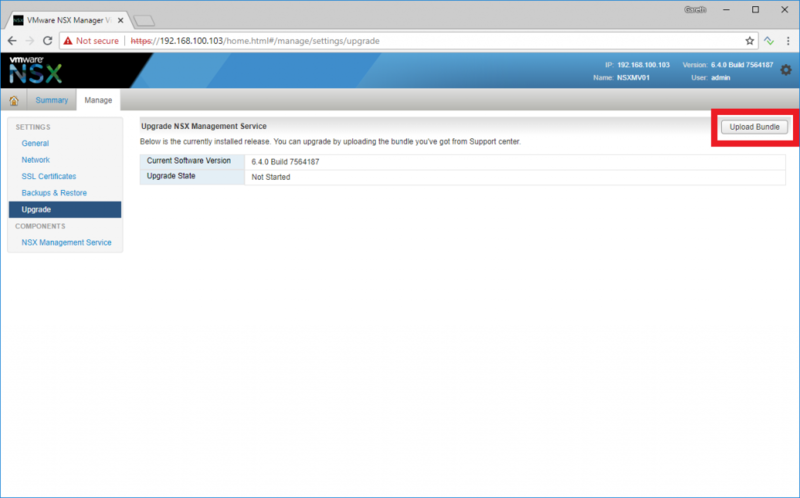 Login to your NSX Manager and browse to Manage > Settings > Upgrade and click Upload Bundle. 4. Browse to the location of the recently downloaded Upgrade Bundle and click Continue. 5. Monitor the Upload process. 6. Once complete, the uploaded bundle will be verified, and you will eventually be presented with the Upgrade Wizard. 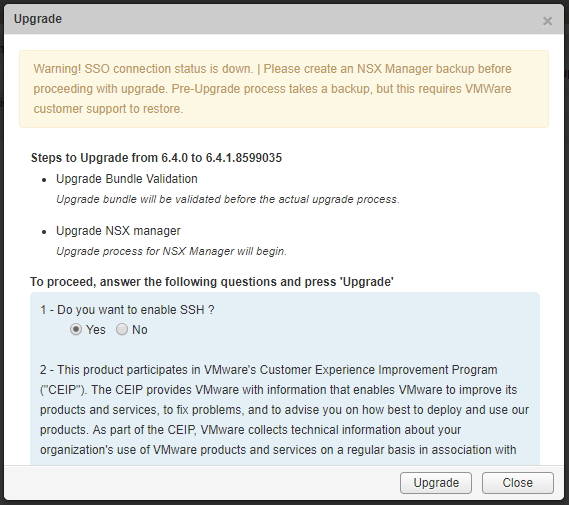 Click Upgrade to proceed with the NSX Manager upgrade. 7. Monitor the Upgrade Process. 8. 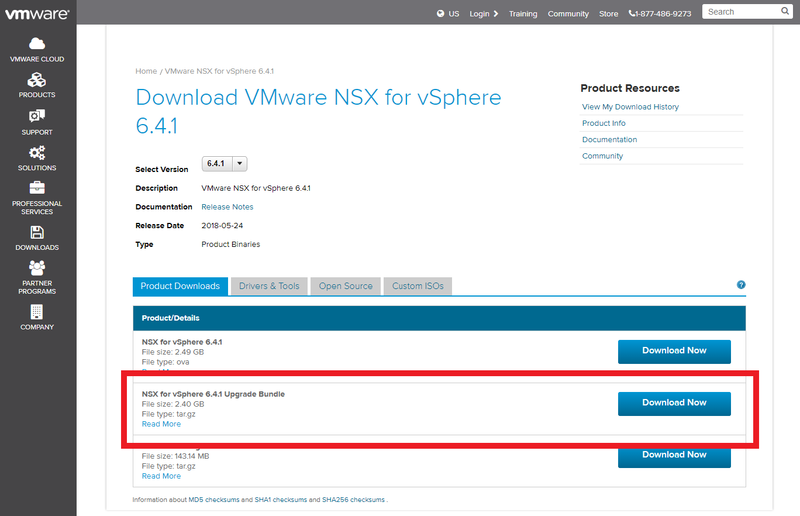 Once the NSX Manager has been successfully upgraded, jump over to your vSphere Client and browse to Networking & Security > Installation and Upgrade > Upgrade. Ensure any/all warnings are reviewed and resolved prior to starting the upgrade. Small lab environments which have NSX Edges not configured to be highly-available will experience warnings. 9. Do you have your backups in place? Last chance! When ready, click Plan Upgrade. 10. Should you wish to customise the upgrade procedure, this is the place. 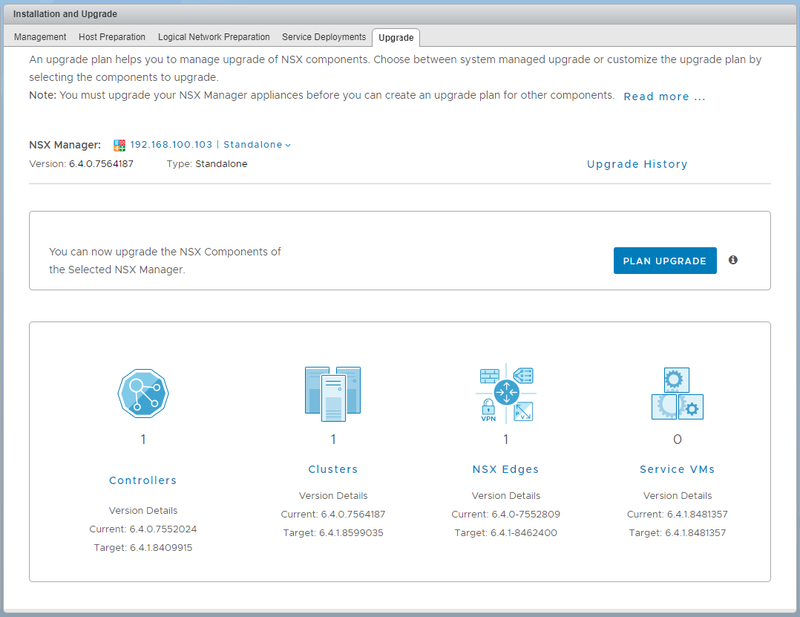 Here you will be able to fine tune which NSX components (clusters, Edges, and/or Service VMs) are upgraded. There is no option to control the upgrade of your NSX Controllers as this is a prerequisite step to the overall upgrade process. In this article, we will only cover the One Click Upgrade. When ready, click Next. 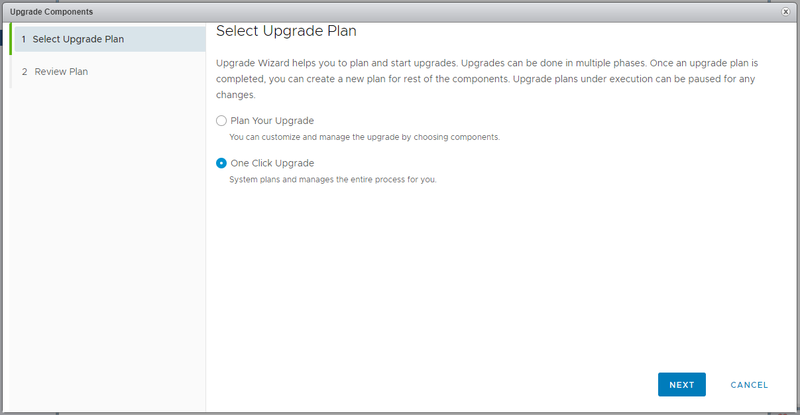 10. Review the Upgrade Plan and, once in an appropriate maintenance window, click Start Upgrade. 11. 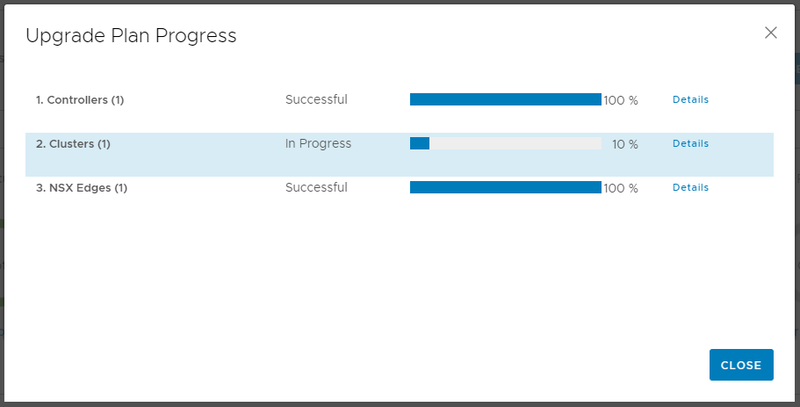 Monitor the Upgrade Plan Progress, clicking View Details where required. 12. When the upgrade progresses to the clusters/hosts, you can monitor process via the Host Preparation tab. 12. 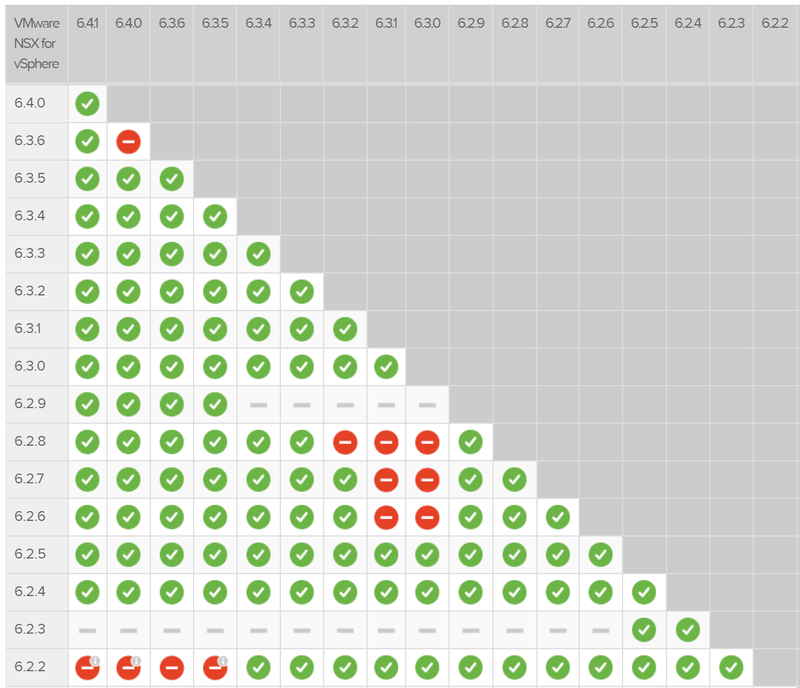 Once complete, all components should be green.